Last weekend the Northeast Minneapolis arts district threw open its doors for their annual cool-weather art crawl, Art Attack. In a gallery on the third floor of the Northrup King Building, tucked away amidst painting, clothing, and ceramic studios, the weary art wanderers found an entirely different experience. REwork: Participatory Art Projects was a weekend-long exhibition that featured interactive works that had previously been enacted elsewhere. 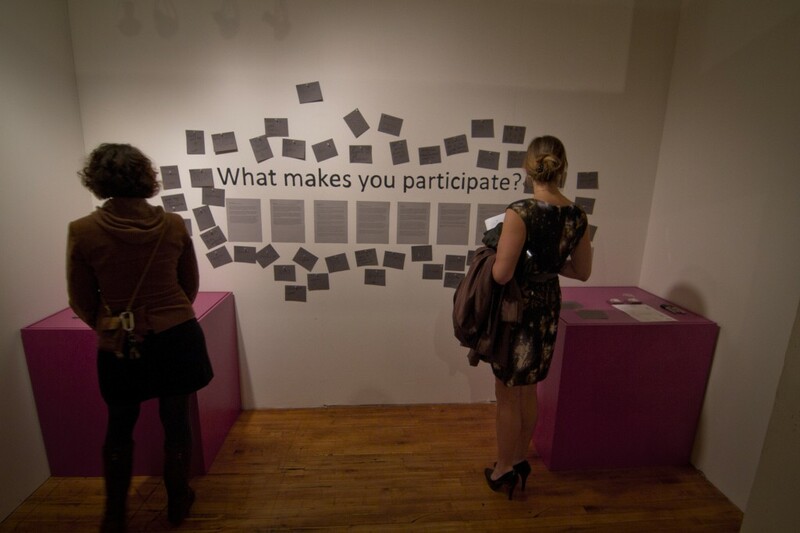 REwork: Participatory Art Projects, “What Makes You Participate?” Photo by Sam Thompson. Curators Molly Balcom Raleigh and Kirsten Wiegmann wanted to give artists an opportunity to see how their projects would shift when restaged in a different context. In some cases, that change of environment proved considerable. Several of the works in the show were originally created for Northern Spark—the sleep-deprived festival that injects art into public spaces in the middle of the night. These projects include Balcom Raleigh’s table for eating and talking via virtual portal to elsewhere called FEED/FEED, Susy Bielak’s call for McSweeney’s-inspired sleep positions, and Jonathan Zorn’s text-based work that was scripted to facilitate responses between participants and the activities, crowds, and architecture of the Minnesota Center for Book Arts during the Northern Spark festival. Pritika Chowdry’s “Memory Leaks,” photo by Sam Thompson. 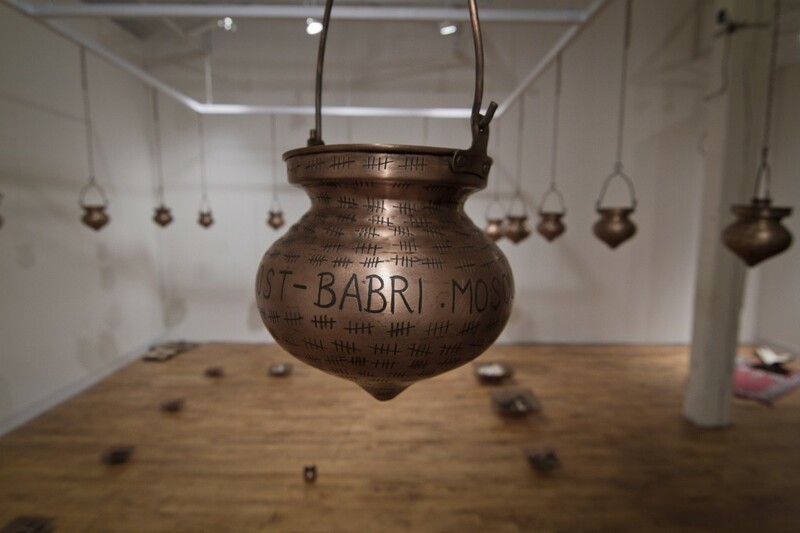 At REwork, those projects shared space with Pritika Chowdry’s “Memory Leaks,” an installation of hanging copper pots that viewers could fill with water and watch it drip into platters on the floor containing burned papers. Nearby, Robin Garwood’s freestanding sculpture, Blind, aimed to illustrate the dizzying effects of Moiré patterns by inviting viewers inside a three-sided, cloth covered frame. Rachel Jendrzejewski created a space that served as the atmospheric headquarters for a roving interactive performance, oneir0nautics, where dancers interpreted fragments of dreams that visitors had written on scraps of paper and then taped to the wall. Lastly, the exhibition’s only non-local artist, Emilia Javanica dressed herself in a nylon “birthday suit” complete with male genitalia to embody “Buoj iz Jeb,” a curious and amenable character. Jeb — a professional life drawing model — invited viewers to draw him with props and costumes they selected from his closet. A room at the back of the gallery contained project didactics and artist bios, which functioned as a necessary contextualization for visitors unfamiliar with REwork’s intentions. 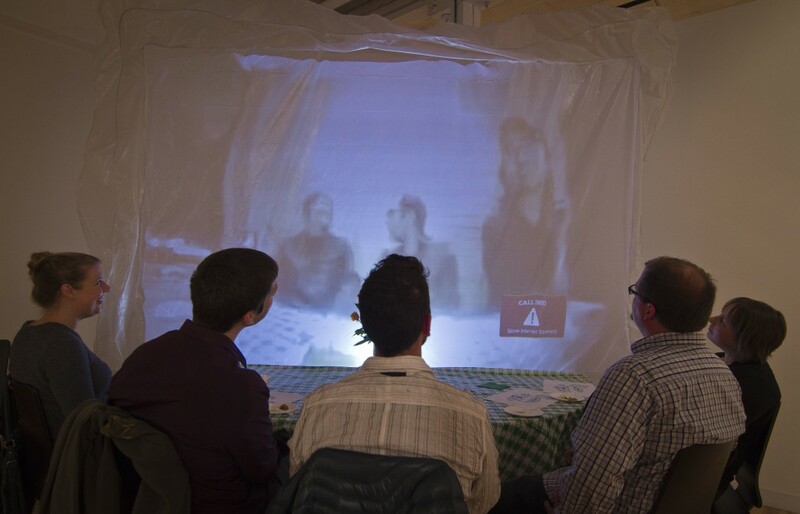 Balcom Raleigh’s virtual portal to elsewhere, “FEED/FEED.” Photo by Sam Thompson. Overall, I found that each project created a distinct environment – some more lively and engaging that others. Naturally, the works that involved a human conduit contained the most energy. FEED/FEED’s half-circle table full of people chatting with pixilated Seattleites on a screen dominated the sociality of the space (in no small part due to the pumpkin bars with whipped cream that were part of the project) and set a tone of comfort and conviviality. Meanwhile Javanica’s unignorably charming character made the intimidating acts of life drawing and social interaction with a (fake naked) stranger feel intimate. Emilia Javanica performs as “Buoj iz Jeb,” a life-drawing model, while a visitor sketches. Photo by Sam Thompson. As I wandered around the space during my visit I overheard several people walk into the gallery and mutter under their breath to their companions, “What’s going on in here? !” Indeed, after rooms full of paintings and pottery, REwork made for a refreshing and active art attack.